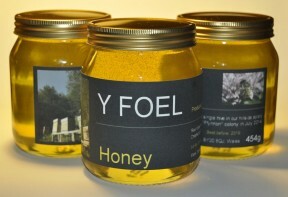 This post will be superseded by a dedicated “Medd y Foel” website once production gets into full swing. 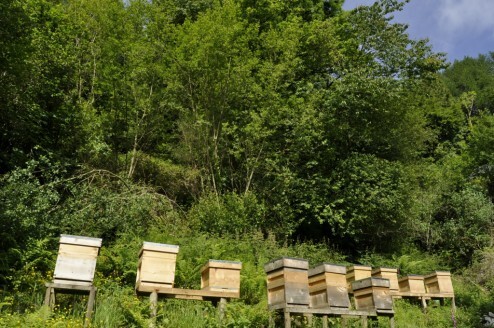 Last year we set up a new venture based around our apiary here at Y Foel. The primary goal is to produce excellent mead, my favourite drink. 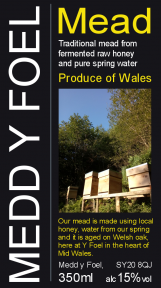 We will also be selling a small quantity of honey locally, but we will pretty much need all the honey crop the apiary can produce this year for mead. 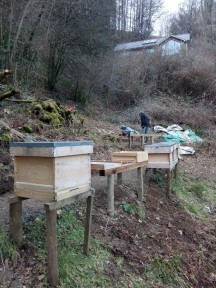 At the start of 2015 we have 4 beehives with 4 young colonies of bees. 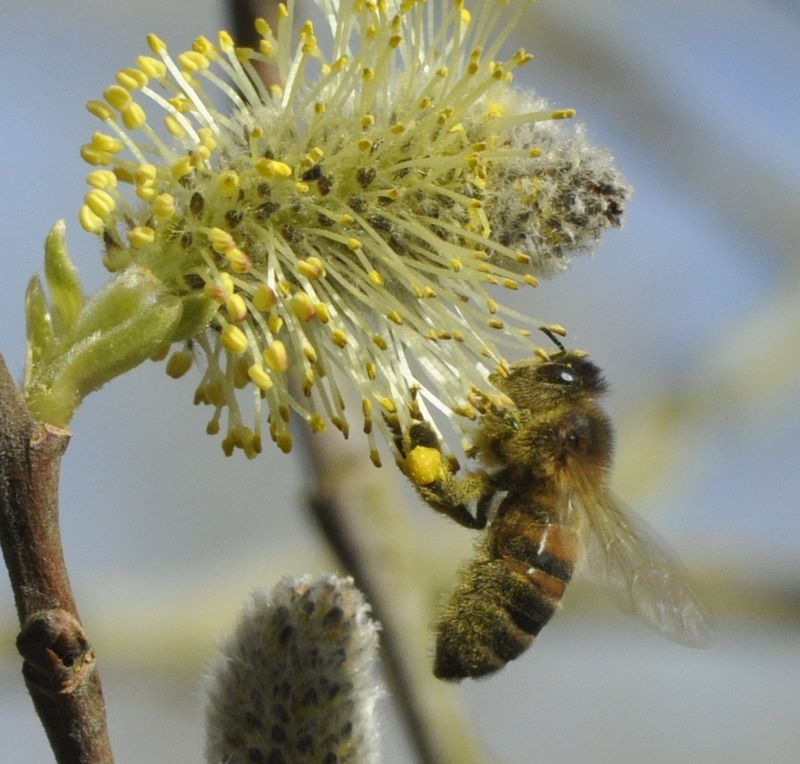 In their first year they managed to produce enough honey for a small 30-litre batch of mead. I made another 2 small batches with late season honey from one of the apiaries run by my beekeeping mentor in the Mawddach Estuary, blended with our clover honey to produce a medium dry finish. The first of these two batches will be available to buy at our stall in the Machynlleth weekly market on Wednesday the 8th of April. By late spring/early summer we hope to have 7 active colonies in the apiary, and by the end of the 2015 season we would like to build up to 10 colonies if we can. The hive stands have been set up over winter ready for the new colonies and hives: Honey bees can get quite upset if you start clearing around them with brush cutters and chainsaws, let alone driving fence posts into the ground and hacking away at the hillside with matocks right next to their homes! The bees have yet to work through a full season here at Y Foel, so we do not yet know what the range of honey will be like. We are pretty sure that in July-August they will again produce more beautiful clover honey: Y Foel is sandwiched between two 1,000-acre farms which both have traditional winter-grazed meadows that are seeded with clover. One of this years very early pollen sources for our bees has been the gorse on the surrounding sheep pastures. 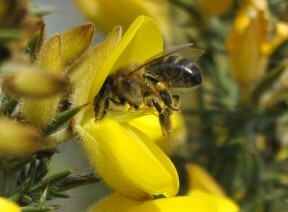 The box was popular too, providing good sized pollen loads. 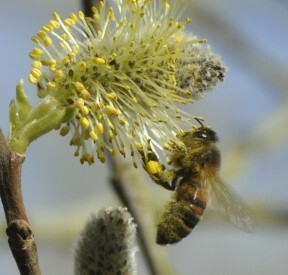 And now some bees are bringing in bright, lemon yellow packets of willow pollen. 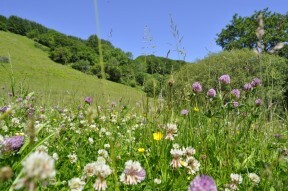 After that Y Foel has some large wild cherry, sycamore, blackberry, broom for the June gap, and then the clover should kick in. Lots to look forward too, weather permitting of course. This year we will have another two small batches of mead for sale after they have aged on oak for two to three months. After this years honey crop we hope to start several 60-litre batches of mead to offer next year. We also hope to have a small number of jars of honey for sale, and for our own use, but the mead will take priority. 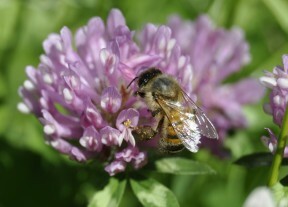 Let’s hope the bees like their new home, and their keepers. 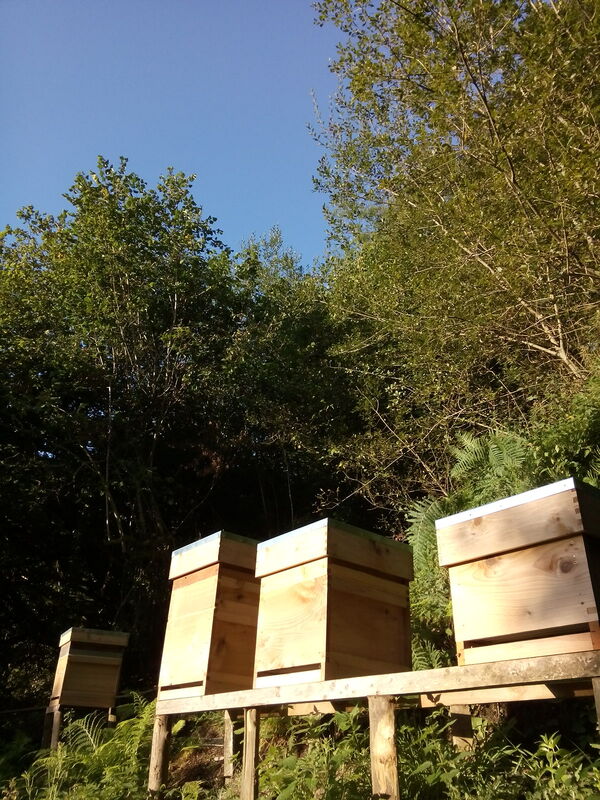 UPDATE: As of 10/07/2015 we now already have 12 hives in operation. 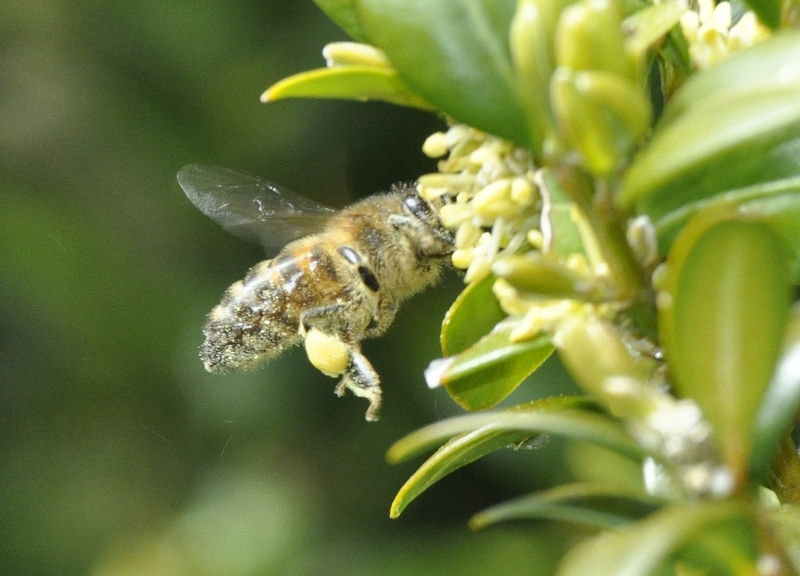 It has been an exceptional year for swarms in our area, and this has led to a rapid increase in colonies at Y Foel. There are now 10 active hives in the main apiary with a further 2 hives in separate locations within the 3-acre site. We split one highly active colony into 3 in early spring, lost 2 swarms from our own hives despite our best efforts, and then gained 3 feral swarms! One of the feral swarms actually entered our bait hive voluntarily. 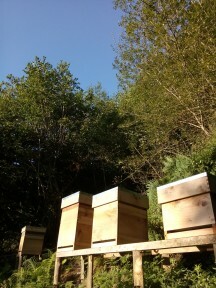 Then just this week our first feral swarm swarmed again, but this time we were able to collect and re-hive it on-site. I’m not sure about the bees, but I am certainly out of breath!